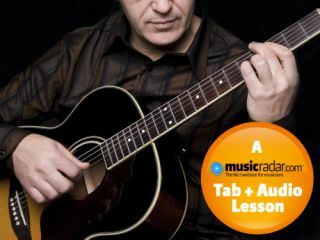 In this series of tab and audio lessons, Guitar Techniques magazine's Stuart Ryan takes you through a gigantic acoustic method for playing fingerstyle blues. This is part three of the series - check out lesson number one here. It's all about texture and harmony here as we take a stock 12-bar blues accompaniment idea and expand it to become something far more interesting and sophisticated. Use this section as an identikit for building a blues rhythm accompaniment - you can mix and match all the ideas here to give yourself a powerful arsenal of ideas for next time you have to relinquish lead duties yet still sound impressive! Even if you are not a fingerstyle player many of these ideas could be re-created with a hybrid (pick and fingers) approach. This hoary old riff may make you groan but it's at the heart of all blues rhythm playing and forms the foundations of the style. Now a little more movement on the fifth string and the chords are taking shape! Some of these examples can sound a little clunky so be sure to use these full chords sparingly! The open fourth string throughout this sequence adds more of a dominant blues feel idea for those funkier sounds. The 3rd and 4th bars also illustrate how you can thin the sound out a little. Notice how the chords are also extended through the scale now so there is far greater melodic movement - this is the real gospel sound in practice. Exercise 5: Finally a full chord version that harmonises an E Mixolydian scale to give a full, rich and modern sounding blues accompaniment. Exercise 5 is great if we are just playing over the I chord (in this case E) so here are several examples of how to flesh out accompaniment when you move to the IV chord (here an A). Obviously the open strings form a large part of the success of these sounds so always make sure you can play these with a capo in case you have to change key! Doing this in F with no capo is also no fun! it's not much use if you can't actually end your blues sequence, so here are some turnarounds to get you back to the beginning! There is a 'passing chord' here - a Bb7 which links between the B7 and A7. This chord does not belong in this key but in this context gives a great sense of descending movement. This exercise starts with a classic triplet feel - very Robert Johnson - and then closes with a walking bass line against the chords. This is a great way of implying movement and making one guitar sound like two! Again, Johnson-ish descending dominant seventh chords played with a triplet rhythm followed by some chord substitutions/inversions to facilitate a descending melody on the first string. Getting all these chords under your fingers can be tricky so start slow and get all the shapes in place first!